Part of the Merlin Entertainments group, Alton Towers Resort is much more than a leading theme park. Integrating a water park, 3 hotels (including the 2017 opening of the UK’s first Cbeebies Land hotel) as well as offering tree-top adventures, and spa, golf and conference facilities, the resort also hosts a variety of events. For 2018, the new rollercoaster experience, Wicker Man, marks another world’s first for Alton Towers: it promises to fuse wood and fire, to give visitors an experience that has to be seen to be believed. Promoting the launch of their newest rollercoaster experience, ‘Wicker Man’ - code name ‘Secret Weapon 8’ - Alton Towers asked CTI to build a microsite, to showcase this latest venture. 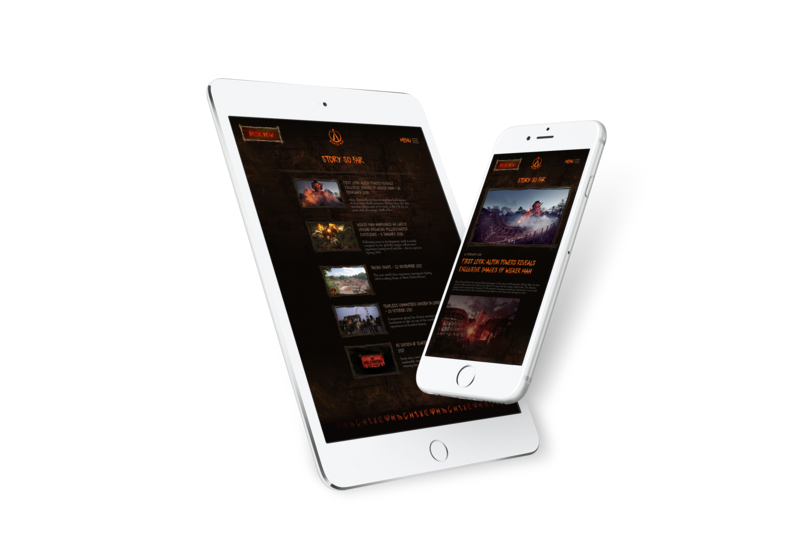 The site needed to be exciting and engaging whilst also editable, in order for the Alton Towers team to populate and manage their content with ease. 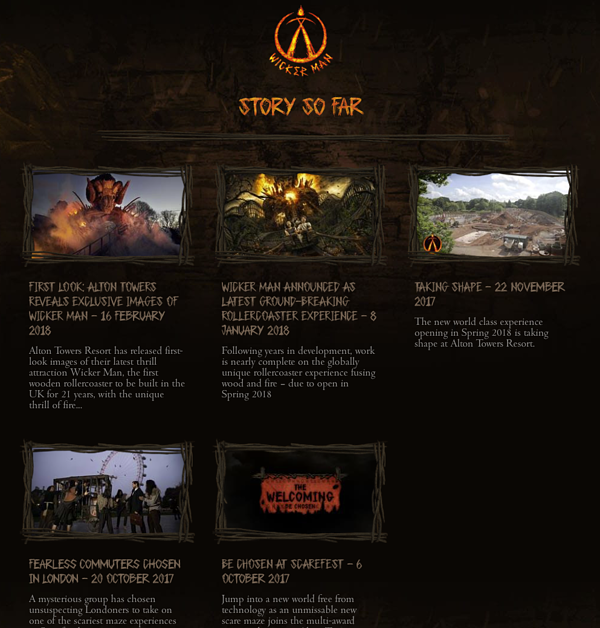 Wicker Man promises to be “the world’s most immersive rollercoaster experience to date”; as such, it was important to provide online promotion that's similarly visual and immersive. Fusing exciting featured imagery with ample space for descriptive copy, the end result offered information that was both clear and exciting. A page dedicated specifically to video content provides a Youtube-style library, encouraging users to watch several videos and consistently engage with the site. We integrated interactive features to create a treasure-hunt-style competition. To reach the next level, users had to discover answers in Youtube videos and enter them on the Wicker Man website. Obviously, this involved an intelligent correct/incorrect marking system, which then linked to the subsequent level. This was an exciting, multi-platform means of gaining visibility, increasing user interaction and developing a buzz around the new attraction. Ultimately, the key aim for this site and new attraction is to boost engagement. Integrating Experian fields enabled users to join the mailing list directly, either completing the form on the homepage or visiting the site’s dedicated sign up page. We focused on providing a strong call to action for purchasing tickets, also including a ‘book now’ button in the header of every page. This redirects the user to the main Alton Towers site, allowing users to buy tickets with just a couple of clicks, without the need to integrate the booking process to the microsite. To create a buzz around the countdown to launch, it was important to provide pages that clearly and concisely report all new updates. We created a news listing page, allowing a user to view all news items at once; this then leads to individual article pages, providing more detail. These pages were designed to allow ease of upload, for the Alton Towers team to publish the latest news content themselves. It was key that the branding of the new microsite connected to the overarching Alton Towers brand. With multiple links to the main site throughout, the transition needed to be seamless for a user. As such, new logos were temporarily installed, so that the fire theme of Wicker Man maintained a presence across the larger Alton Towers site. 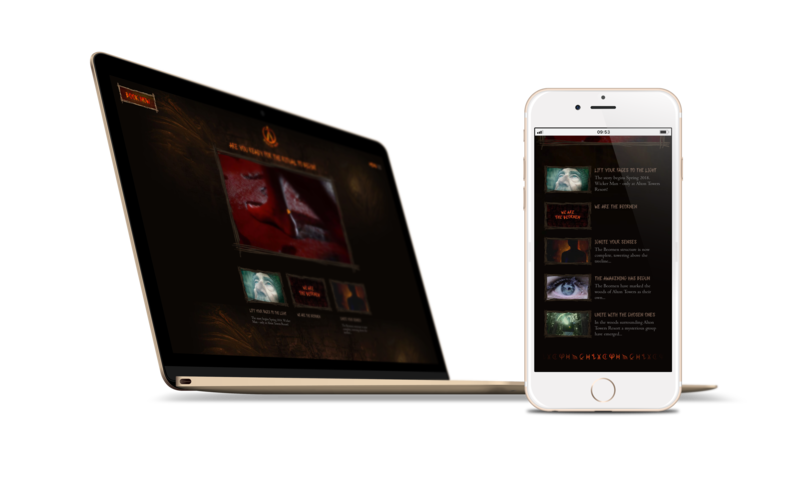 We were able to produce an exciting and engaging application for the launch of Alton Towers’ latest rollercoaster experience. Having worked on the main Umbraco Alton Towers site, we were able to create a seamless connection with the microsite, whilst also allowing this application to champion its own key branding identity.